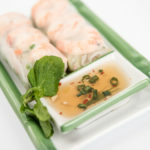 Vietnamese spring rolls are a fresh, healthy alternative to deep fried rolls and are perfect for people who want to use their hands and get involved in the food prep. We were surprised just how much fun it is to make these spring rolls – everyone wanted a turn! The best part is that everyone can make their spring rolls just the way they like them because they’re so easy to customize. The bright flavors will make you feel energized and full, without the uncomfortable heaviness. And the dipping sauce adds a spicy sweetness, the perfect complement to the herbs and rice noodles in the rolls. Go ahead and invite a few friends over, lay out your ingredients and roll up your sleeves. Just try not to eat all the spring rolls before your guests arrive. Step 1: Dip a rice paper wrapper in a shallow plate or bowl of water, making sure it’s completely covered, and immediately transfer it to a cutting board or plate. Step 2: Place shrimp halves near the center of the wrapper, in a straight line. Step 3: Add a small piece of lettuce to the side of the shrimp. Step 4: Add your choice of herbs on top of the lettuce. We like to use mint, Thai basil and cilantro. Step 5: Sprinkle shredded carrots over the herbs. Step 6: Add thinly sliced, peeled cucumber slices. Step 7: Drizzle a bit of the garlic mixture over your ingredients. Step 8: Add a pinch of rice noodles, looping them around so they fit over the lettuce and don’t hang off too far. Step 9: Fold one side over the top of your ingredients until it reaches about halfway. Step 10: Fold the opposite side over so it meets in the middle and gently press the rice paper together. Step 11: Pull up the edge by the lettuce and gently roll, pinching and tucking the wrap with your fingers as you go, toward the shrimp. Step 12: When you reach the shrimp, pause and add a scallion (optional) into the roll for decoration. Then, continue rolling until the rice paper folds over itself into a taught roll. Step 13: Show off to your friends and family because you just rolled a gorgeous Vietnamese summer roll like a pro! Heat oil over medium-high heat in a large skillet. Add onions, garlic and ginger. Stir for 2 minutes. Remove from pan and place in a bowl to cool. Add shrimp to pan and stir until shrimp is pink and cooked through. Remove from heat, set aside to cool. Slice shrimp in half lengthwise. Work with spring roll wrappers one at a time. Dip a wrapper in a shallow plate or bowl of water, making sure it is completely covered. Immediately transfer wrapper to a cutting board or plate. Place 3 shrimp halves, cut-side up, near the center of the wrapper, in a straight line. Place a lettuce leaf to the side of the shrimp. Top lettuce with basil, mint and cilantro leaves. Sprinkle with shredded carrots. Add cucumber slices. Drizzle with a little of the onion mixture. Add rice noodles, looping them to fit over the ingredients. Fold opposite top and bottom sides together in center. Roll up tightly starting with the lettuce side. Pinch and tuck the wrap as you roll, ending with the shrimp showing through the wrap at the top. Wrap with plastic wrap and store in refrigerator. 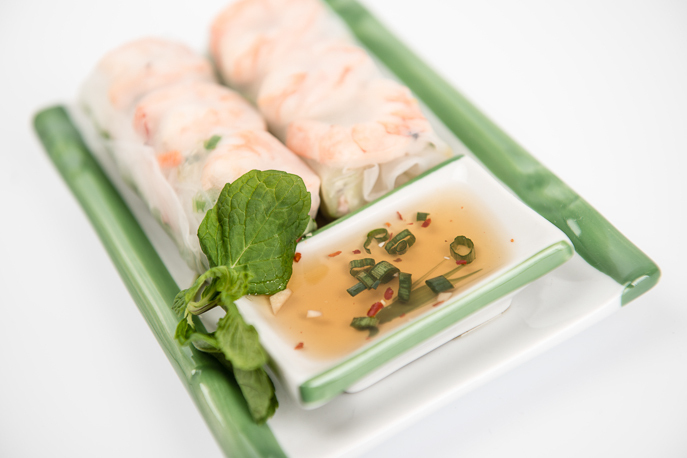 Serve with Vietnamese Spring Rolls Dipping Sauce.